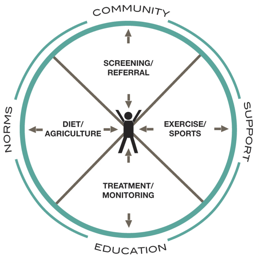 The Community Wellness Networks (CWN) project is an inquiry into the factors bearing on behavior-related disease and health. In particular, the project will explore how the most important of these factors could be approached in an integrated, holistic fashion; and how they can best be supported by community structures, and appropriate local facilities and technologies, to create a wellness network and offer improved outcomes. Diabetes, heart disease, and other behavior-related maladies are increasingly common, especially among New Mexico’s Native American and rural Hispanic populations. They are imposing significant costs on the individual sufferers, their communities, and the health system and larger society. A community-centric approach that seeks deep integration may prove to be highly effective, and at minimal net cost. The CWN project will be a collaboration among qualified expert partners in the relevant domains, and with an interested community. It will be designed to serve as a laboratory, to explore the potential for integrated programs and holistic community-based solutions. The project’s initial phase will be devoted to understanding current best practices within the applicable sectors, and efforts in integrated care; and to enlisting the active participation of the community and its members in understanding their needs and concerns, and how a more holistic and community-driven approach might work. If the initial results are encouraging, subsequent phases will design and deploy holistic solutions in the community on an experimental basis, including business and finance models, support systems, and technologies, and then measure and assess results and modify the programs reiteratively. A final phase will seek to scale the most effective practices and programs to other interested communities; and to diffuse the insights generated as broadly as possible.